Halston, Lagerfeld, de la Renta. And what they did, what they created was greater than art because you live your life in it. The bass pumped from unseen speakers, and the crowd took a collective anticipatory breath. Across the brightly lit aisle from me sat some of the cast of AMC’s new television series Freakshow, which features the lives of some of Venice Beach’s most adored, well, freaks, such as the tallest man in America and “Creature,” one of the most pierced and tattooed people on earth. Beside them sat Takeshi Yamada, the taxidermy master from AMC’s Immortalized, holding his prized creation and accessory, a rabbit/duck/seal “monster” named Seara. But even Yamada’s perversely amusing version of a lapdog couldn’t hold my gaze when the first look of CZAR by Cesar Galindo’s Fall 2013 presentation appeared on the runway. The next fifteen minutes went by in a blur, but by the end of the show I was already in love with this fall’s new fashions. While VIE has enjoyed a tradition of attending Mercedes-Benz Fashion Week events in New York City for the past six years running, this February was my first Big Apple adventure as part of the team. There’s something about that city that always makes me feel like I’m coming home. I grew up as a country bumpkin in northern Alabama, and even though I enjoyed fishing and floating in the creek, going to the state fair every fall, and sitting on the porch shelling peas from my Granny’s garden, it’s when I’m walking through urban jungles, especially New York, that I feel I’m in my natural habitat. And from the moment we entered the city for Fashion Week, I could tell there was going to be an even bigger buzz there than during my previous visits. We checked into the Gramercy Park Hotel in Midtown, whose sleek marble lobby was nothing compared to the rooftop terrace restaurant and the original Warhols upstairs. We spent our first night in the city recovering from the flight, planning our week ahead, and hoping we wouldn’t be snowed in the whole time. This was silly because, as I learned, even when Winter Storm Nemo drops several feet of snow and ice on the city, it’s back to business as usual the next day. 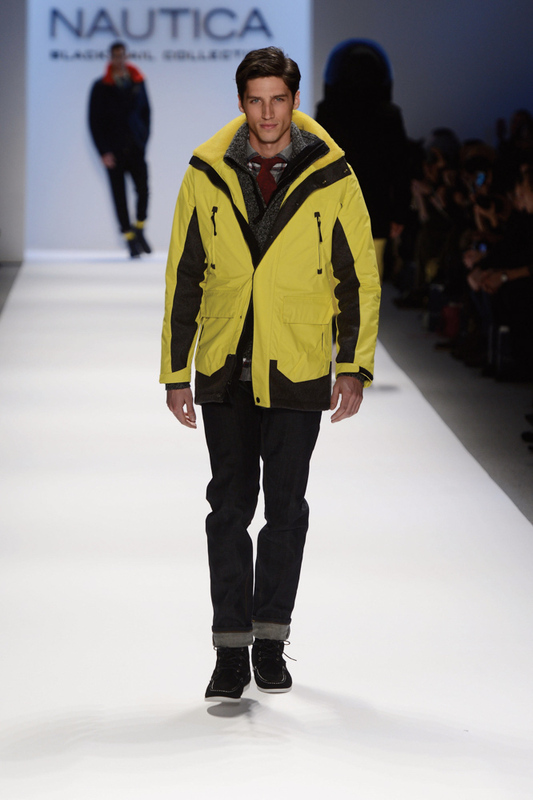 Cabs still ran, people traipsed across slick sidewalks, and Fashion Week proved to us that, as they say, the show must go on. You’d better believe it did. Photographers and video crews waited outside Lincoln Center, snapping candids and halting anyone whose outfit was deemed blog worthy. Inside, members of the press, fashion gurus, buyers, bloggers, and celebrities alike milled around the central hub of Mercedes-Benz Fashion Week, visiting the kiosks of sponsors such as Maybelline, Style.com, and Aveda. But the real action was in the tents, where the fashion industry’s top designers showcased their looks for the next season. The lights dimmed as the paparazzi retreated from taking shots of Anna Wintour and found their spots at the end of the runway instead. A live band, Wild Cub, cranked it up, and the Rebecca Minkoff presentation took off. Models in a mixture of futuristic silhouettes and comfy textures that made me seriously excited for fall began striding along the U-shaped runway, around two rows of VIPs seated in the middle. It hit me. 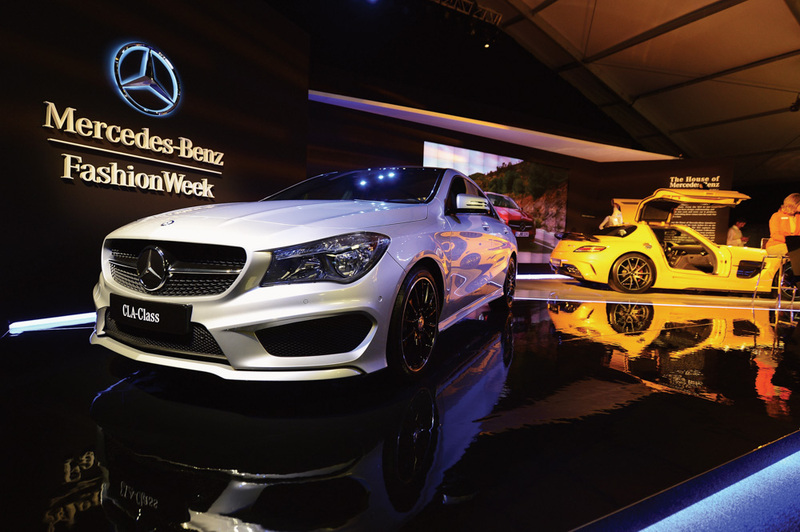 This wasn’t just a celebrity-studded event to market another multibillion-dollar industry. It was a mecca, a destination for artists of all types to become inspired, to be excited for the future, and to connect with others who were doing the same thing. All of us—the magazine editors watching from the front row, the band performing, the designers, the photographers, the hair and makeup teams, and even the models—were there to share an artistic experience and to draw our own conclusions from it. Because that’s what art does; it makes people think differently, and not everyone will think the same thing about a piece of art, just as not everyone will want to wear the same thing next season. Mercedes-Benz Fashion Week – Fall 2013 from VIEzine on Vimeo. Somewhere in the world of labels and trends, people have forgotten the fact that fashion is about expression. What you wear can reflect who you are, what you do, or even something as simple as how you’re feeling that day. My own style has changed multiple times over the years, sometimes reflecting what’s “hot” and sometimes not. Along the way, I learned that fashion is not about the looks people give you or what they think when you walk by; it’s about how you feel in your own skin—and how you feel in what covers it. And I have to say, wearing a cheetah-print KUT jacket and Liverpool jeans while sitting in the third row at Nautica’s first-ever appearance at Lincoln Center for Fashion Week, watching some of the most gorgeous men I’ve ever seen stalk down the runway, I felt comfortable, like I belonged there just as much as someone in Chanel or Ralph Lauren couture. 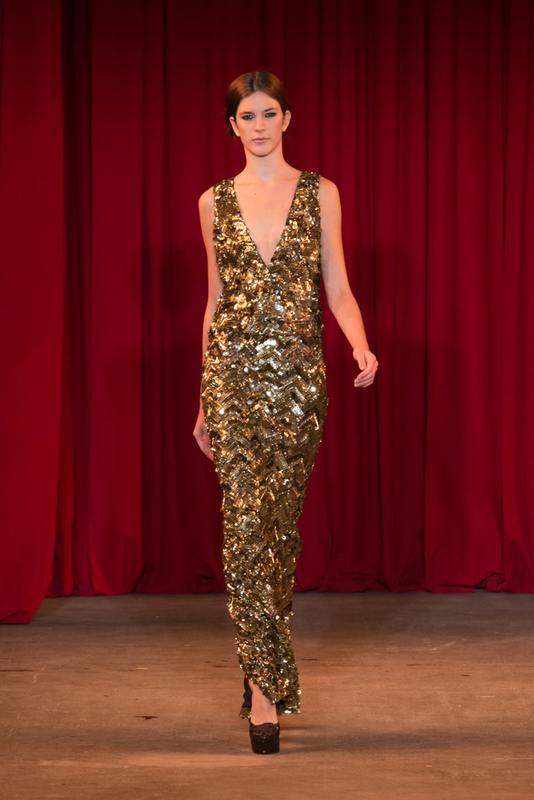 A shining example of fashion as art came in the work of designer Christian Siriano, whom VIE has followed throughout his journey to becoming a fashion icon since his debut at Mercedes-Benz Fashion Week in 2009, after he won the reality competition series Project Runway. 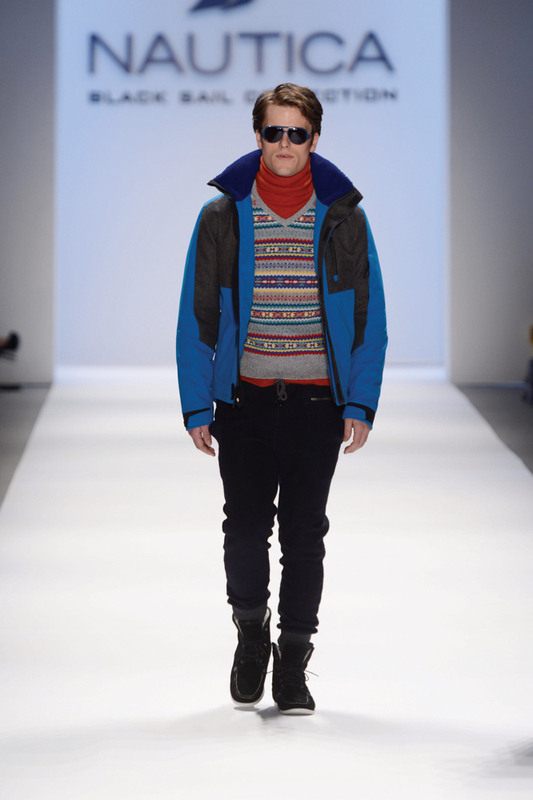 We journeyed—freezing, thanks to Nemo—to the Chelsea neighborhood of Manhattan for his Fall 2013 presentation at Eyebeam Art and Technology Center, one of the few official off-site venues for Mercedes-Benz Fashion Week. The wait outside in the blistering wind was well worth it; being in a new setting gave me preshow butterflies as I walked past celebs giving interviews in the dimly lit studio. Red crushed velvet curtains hung at the edge of the room, with three stunning crystal-and-gold chandeliers hanging just in front of them. This was a testament to Siriano’s vision, making it clear to us that he wanted to do his own thing by presenting his art in a setting of his choosing, evoking a different feeling than that of a sterile Lincoln Center runway. From the very first black-on-black, Russian-inspired look, I was ready to wear this collection all fall and winter long. 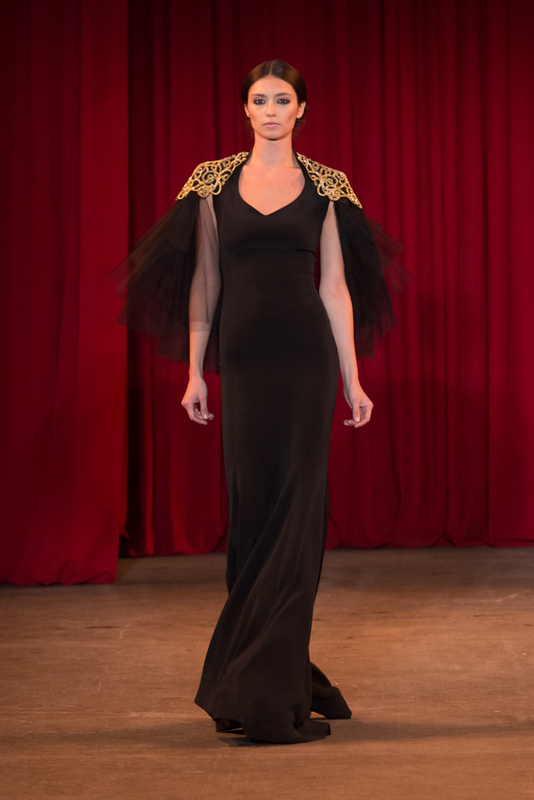 Leather, velvet, brocade, and chevron patterns in black and gold set the tone for the whole show, whose inspiration came from the Mariinsky Theatre in Saint Petersburg, according to Siriano. 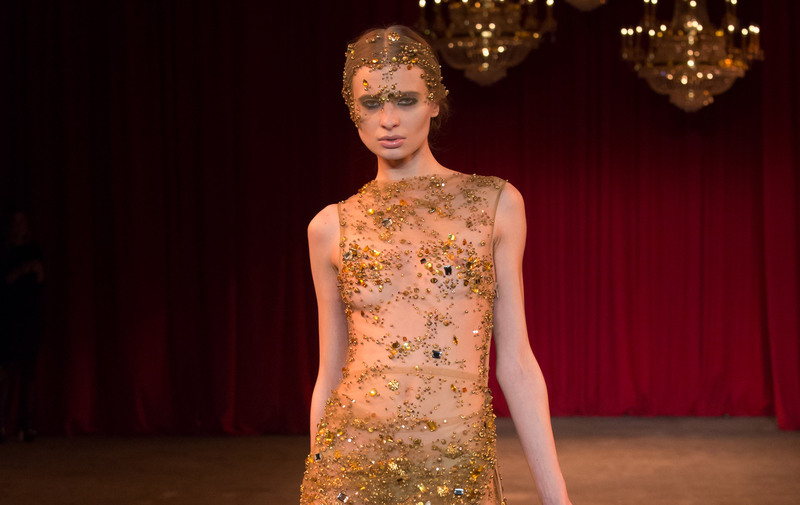 The last look, an awe-inspiring sheer gown covered in strategically placed gold sequins and crystals, certainly made a statement as the model wearing it led the rest of her flock out for the final walk. 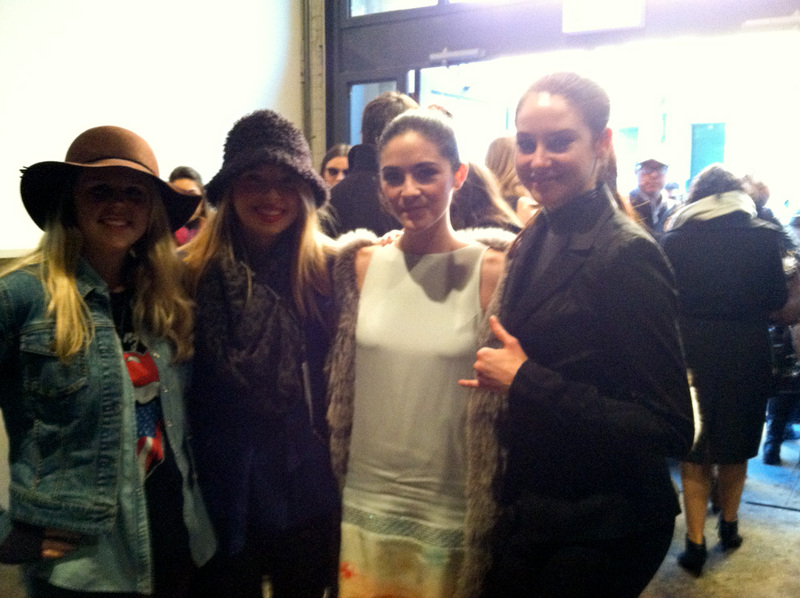 After the show, we stopped to snap a photo with young actresses Shailene Woodley (The Descendants) and Isabelle Fuhrman (The Hunger Games) before heading back out into the cold for the next show, Alexandre Herchcovitch, at the famed Milk Studios just down the street. Art comes in all forms, and sometimes you don’t even notice it’s there—but someone will. This fact was driven home for me throughout the week in everything from the Warhols in our hotel to the incredible performance of Cat on a Hot Tin Roof we witnessed on Broadway. Life is about having experiences, artistic or otherwise, and sharing them with others. For me, places like New York City bring awareness of these experiences to the surface, and I can’t wait to share what I learn from my next adventure there. 2013 Fall Fashion Sneak Peek from VIEzine on Vimeo.